Cutting and grooving speeds are getting faster to improve productivity while higher machining quality is required to optimize the process. 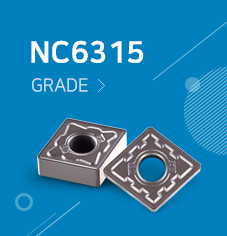 It was difficult to meet these requirements as the thin and long shape of grooving inserts caused vibration and reduced chip evacuation during operation, which resulted in early wear or breakage of tools. The EKGT has an excellent ‘V’ type clamping system and a serrated shape on the clamping area so that it effectively minimizes vibrations. This results in improved stability and performance for highly efficient machining. EKGT holders provide a total tooling solution with a wide selection for external / internal diameter machining, parting off, copying, auto lathes and relief machining. KGT chip breakers are ready for a variety of workpieces and a wide application area with its characteristics of excellent chip evacuation for quality surface finish and high precision.